According to CMS physicists, quark-gluon plasma is a very hot and dense state of matter of unbound quarks and gluons. “It’s believed to correspond to the state of the Universe shortly after the Big Bang. The interaction between partons – quarks and gluons – within quark-gluon plasma is strong, which distinguishes the quark-gluon plasma from a gaseous state where one expects little interaction among the constituent particles, ” said team member Dr Quan Wang of the University of Kansas. “Indeed, these collisions were being studied as a reference for collisions of two lead nuclei to explore the non-quark-gluon-plasma aspects of the collisions, ” said Dr Wang, who is a co-author on the study published in the journal Physical Review Letters. According to the team, this unexpected discovery sheds new light on high-energy physics. 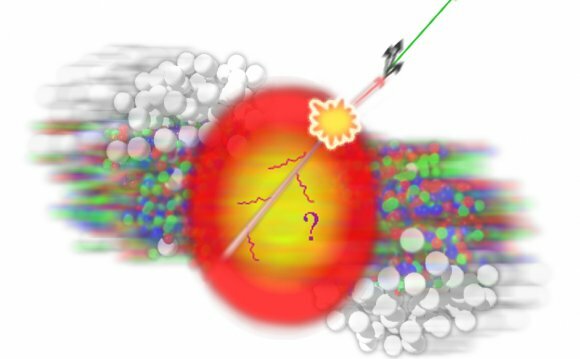 “This is the first paper that clearly shows multiple particles are correlated to each other in proton-lead collisions, similar to what is observed in lead-lead collisions where quark-gluon plasma is produced. This is probably the first evidence that the smallest droplet of quark-gluon plasma is produced in proton-lead collisions, ” said co-author Prof Yen-Jie Lee of Massachusetts Institute of Technology.